The increase of recreational drum circles continues to grow around the world for a number of reasons. Drum circles attract both regular and drop-in participants of all ages and appear in almost every setting such as community centres, schools, conferences festivals and homes. As well as being a celebration of life, they foster musicality, health, community, relationships and have many positive outcomes such as reducing stress, improving wellness, and fun. 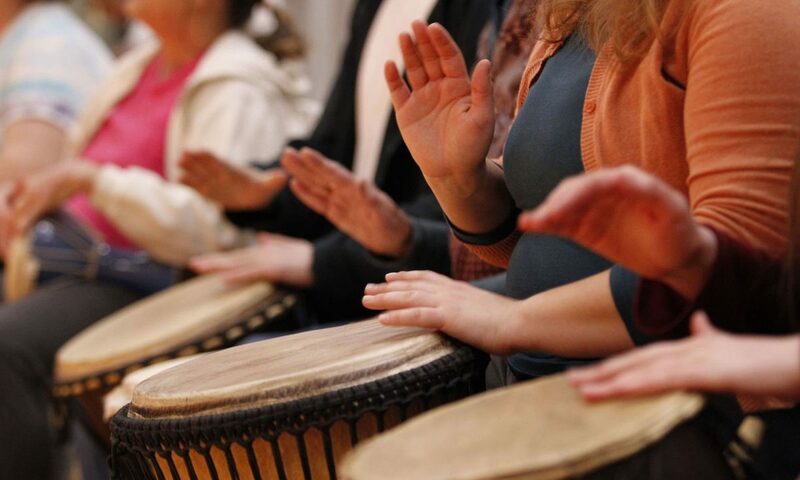 There are many kinds of culturally specific ‘Drum Circles’ including African and Latin drumming where rhythms are practiced and learnt for performance. ‘Swanage Community Drum Circle’ is distinct from these drumming groups in that the drum circle is an end in itself rather than preparation for a performance. Sometimes described as free-flow drumming or drum-jazz, participants make up their music rhythms as they go along. Using our listening and playing skills enables us to make musical connections through a process of group interaction. As ‘drum facilitators’ we often use rhythm games as a tool for moving the group forward in their understanding of becoming a rhythm ensemble. Although much is centred around drums, percussion, voice and body percussion, other musical instruments are sometimes used to explore the world of rhythm fun. Practically any everyday item that can be tapped, banged, scraped or rattled to make a noise can be used as a percussion instrument, and you don’t need a drum to participate. We provide djembes and other drums, shakers, woods, bells and other weird and wonderful percussion to play, and you are welcome to bring your own instruments along. Our facilitated drum circle currently meets every month except July and August. All are welcome regardless of musical experience and drumming knowledge. Come along and enjoy the experience of creating rhythm-songs together in a friendly community atmosphere.